For anyone seriously considering starting a commercial strawberry farm, cost calculations are critical. Most strawberry farms fail due to the farmer’s lack of economic knowledge, not their lack of farming knowledge. One of the basic questions that must be answered when considering the numbers is how many strawberry plants per acre should be planted. Generally, a new strawberry farm should start small. Calculating the number of strawberry plants per acre is much easier and less risky when the farmer doesn’t jump in with both boots. 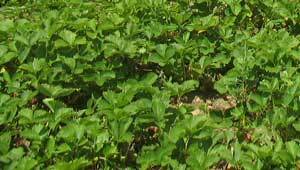 The first planting for a newbie berry farmer should be around 1/2 acre to 1 acre of planted strawberries. This allows the budding strawberry business to grow as the farmer learns (without suffering a bankrupting loss if the learning is through the school of hard knocks). The tried and true system for perennial commercial matted row strawberry production encourages rows spaced 4 feet apart with strawberry plants planted 24 inches (2 feet) apart in the rows. This system will require a little less than 5,500 strawberry plants per acre to be planted. There are, however, other spacings and systems that can be used. For handy reference, see the table below. Would this information be the same for indoor strawberry growing? This is a nice forum.. Am planing to start farming strawberries here in Kenya…your ideas are encouraging. Thanks folks. I have 3 acres in east Texas. I would like to start a organic strawberry farm. Can you tell me what my start up cost would. How much profit I can make each year on 3 acres. Check with your local extension agent! The extension agent should be able to give you that information for your area and help you get the process started successfully. Good luck! My wife and I are looking into starting into a small strawberry farm venture up to 3 acres of strawberries in a rotation year one through three on there own acre etc. We live in Just outside of Saskatoon Saskatchewan with a rich light clay loam soil which seems to support almost anything we are growing. It has a ph in the range of 6.5 to 7. We are considered a zone 3. We realize that winter prep will more than likely be a must. Is there a particular variety of strawberry you would recommend? Also do you know of any reading materials that help us on our way? We have spent most of our lives in various types of farming and gardening, with only small plots of unknown types of strawberries in our garden. To make it a successful venture, I would definitely recommend getting some professional help as you start up. If there are agricultural extension agents available, they can be a tremendous help in avoiding pitfalls and making sure you start off well. As to variety, see here. Good luck! Well! See here for help, and good luck! I am interested in trying to cultivate some Japanese strawberries…(Amaou) However, they will be growing in large plastic containers (30 gallon, black plastic) in the mid-Atlantic region of the US. Is this a fools errand? I need some cultivation, recommended soil, fertilizer, indoor/outdoor growing tips. No, it isn’t a fool’s errand; you can do it! I’d recommend that you start here. Good luck! Hello me and my wife are looking to plant 5 acres for you pick and have had a hard time finding BENTON STRAWBERRIES, if you know of any nurseries that have them in bulk, I’d appreciate the information, thank you. All of the suppliers of which I am aware can be found on this page. Good luck! thank you for posting the graph / table, which shows strawberries per acre. You are welcome! I’m glad it helped. Good luck!